If the truth were to be told, there are many families out there who are tired of the trashy entertainment that fills the airwaves. Our family had to finally resort to turning off the TV and sticking with family friendly movies that we could rent. However, this past year, Family Movie Night has successfully reached millions of viewers all across America. Movies like Change of Plans and A Walk in My Shoes offered families wholesome alternatives and teaching moments with their children. 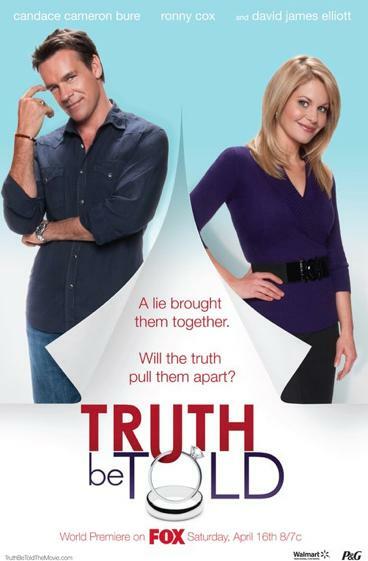 Now, the latest in the Family Movie Night series, Truth Be Told, is set to air this Saturday, April 16th, 2011 on FOX. I previewed the movie this week and was once again pleasantly surprised. Truth Be Told addresses the importance of honesty and personal integrity even when faced with great temptations. The wisdom of the world is to compromise the truth in order to achieve your goals in life. The movie highlights the consequences of such action and worldly thinking. The moral is that honestly is always the best policy. The movie was lighthearted and fun to watch and, like the other Family Movie Night films, it stressed the importance of family unity. ultimately it’s what opens our hearts and brings out the best in each other. So make plans with your family to enjoy Truth Be Told this Saturday. For a preview of the trailer click here. I Will Praise You WINNER!